Something spooooooooky in the kitchen! 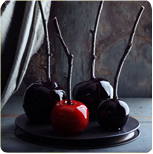 I’m not a huge fan of candied apples but these are so shiny they are drawing me in. I just want to take photos of them! And of course they aren’t really poison. They are probably delicious!